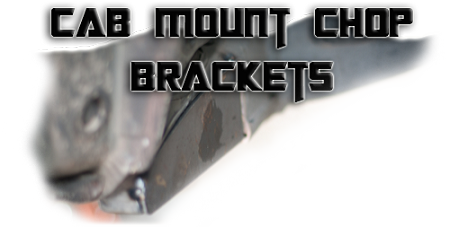 CMC (Cab Mount Chop) brackets The brackets are CNC cut 11 Gauge steel with an exact contour of the cab mount. No more need to cut and grind steel bought from the hardware store. 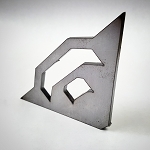 These are a perfect match to your cab mount saving you time and money on wasted steel. They are designed to allow for 285 tire clearance. 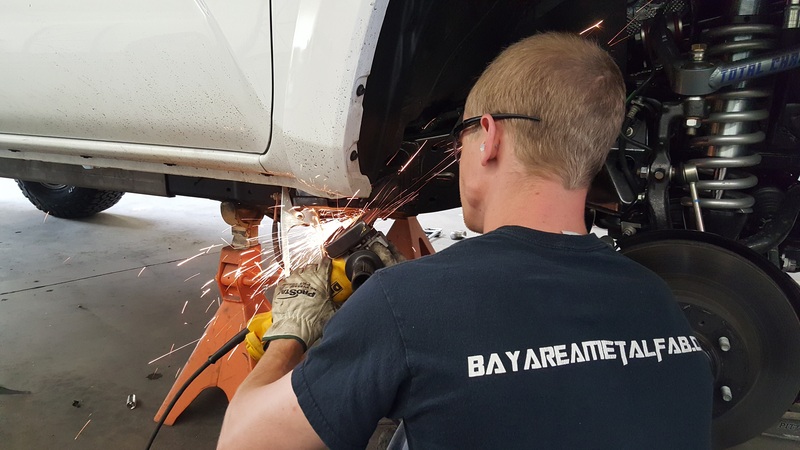 It is highly recommended that you wait to cut your cab mounts until you get our plates. Different models have different shape plates so wait for the plates to cut the mount using the plate as a cutting template. Here is a little breakdown of the Install for the Tacoma and Tundra style. 4Runner CMC pictures are displayed at the bottom of a page. 4.5" angle grinder with a flap disk and Zip Wheel. Or better yet a plasma cutter! First thing remove the negative terminal from the battery, jack the truck up and remove the tires. Then lay the BAMF plate on the cab mount and trace what you need to remove. Note I lake to remove less on the first cut then fine tune it with the flat disk. You can see the yellow mark on the left you will need to remove that plastic as well with the razor knife. This is how it should look once cut and sanded down. Next you will want to tack only the back of the mount if you removed enough you will have a gap at the outside of it. Now you take your hammer and tap the plate until it forms the cut. You don't have to get it perfect that's why you have the welding clamp. Clamp the cab mount and plate together until the gap is gone and tack in place. Once tacked you can start welding it up. Now remember you are not out to win awards on weld appearance. Just stitch weld it staggering the welds so you don't over heat the rubber mount. Now that it's all welded up you can now blend the welds as if they were never there. Once it's all blended prime and paint the mount inside and out to prevent rust. The install is the same process as the Tacoma but you will be cutting the cap off the cab mount and re capping it. My new 285/ General Grabber AT2 were rubbing so I had to do a cab mount chop.. These were the best priced brackets. After welding them on you couldn't even tell that my truck had any work done. 1 word.. Perfect!!! These plates are exactly what I needed after I installed some Goodyear Wrangler Duratrac tires. Before having these plates welded on, my tires would rub on the frame. Now they completely clear without any issues. Jerry at B.A.M.F. is an awesome guy and even helped me with the install. As soon as I save up enough cash for some sliders, I know I'll be coming back to B.A.M.F. !